"The love that iron has for oxygen causes great suffering because of the rust it produces and because we hardly possess sufficient means to combat it." This was a complaint expressed in a textbook entitled, ‘Die chemische Behandlung der Rohstoffe’ (‘The chemical treatment of raw materials’) published in 1877. Due to the war, copper was in short supply at the start of the 20th century and so there was a large demand for laundry cauldrons made of sheet iron. To protect them from corrosion, Heinrich Bablik founded a hot-dip galvanizing plant in Brunn am Gebirge in 1916, laying the foundation for industrial-scale contract galvanizing. His sons – Dr Hans Bablik and Prof. Dr Heinz Bablik – took over the company and founded BBB – Brunner Verzinkerei Brüder Bablik – in 1926. The site was soon to become the centre for hot-dip galvanizing and Prof. Heinz the authority for all aspects of the process. Today, 100 years after it was founded, there are virtually no limits to the application of hot-dip galvanizing. 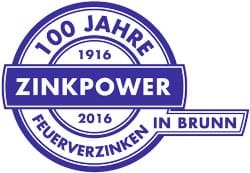 The Brunner Verzinkerei Brüder Bablik became ZINKPOWER Brunn – but its logo with the three Bs still reminds us of the company's origins.